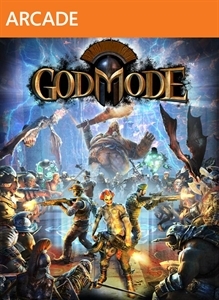 God Mode combines non-linear gameplay, fast and frantic shooting, hordes of on-screen enemies, and stunning visuals. The game hosts a single-player mode, as well as online and offline (via LAN) co-op play with 1-4 players. In addition to accessing more than 11 different weapons for battle, players are also equipped with a special ability fueled by Rage, which is gathered by amassing kills. Players can choose from several different powers ranging from offensive, to defensive, to support; all of which can be upgraded. A series of in-game modifiers known as Tests of Faith alter gameplay on the fly and ensure that matches rarely--if ever--play out the same way twice. Each character is fully customizable, both in appearance and equipment, which evolve throughout the game. Gold and experience are accrued by players in a reward system to unlock new weapons and unique, powerful abilities, both of which have the option for further upgrades. Based on the upcoming 3D supernatural action-adventure film, R.I.P.D., you and a partner will take up the holsters of two lawmen dispatched to the otherworld to protect and serve the living from an increasingly destructive array of souls who refuse to move peacefully to the other side. Top-notch teamwork and an arsenal of badass weapons are the key.. The First Templar is a medieval-era action adventure game for the Xbox 360 and the PC. The game portrays a dark and gritty view of the late 13th century where old friends become enemies, corruption spreads throughout the Church and fallen knights oppress the weak and renounce their oaths. The First Templar follows the story of two main characters -..
Catherine is an unprecedented exploration of the pleasures and horrors of love. As Vincent, a man recently succumbed to the irresistible beauty of the game's titular diversion players find themselves swept into a treacherous love triangle. Catherine's core themes-those of free will, of the delicate nature of relationships and the choices we make wi.. The Dragon Knight Saga is set to include the complete and re-mastered adventure Ego Draconis, plus the brand new adventure Flames of Vengeance. ..